We asked 7,200 participants from 15 countries around the world about 'the image you get about Korea' through the <2016 - 2017 Global Hallyu Trends> run by Korea Foundation for International Culture Exchange. Korean food (12.5%, including food products) won the first prize, rather than K-Pop or dramas. 'The most popular Hallyu content” also saw Korean food (47.1%) beat fashion / beauty (41%) and K-Pop (33.4). 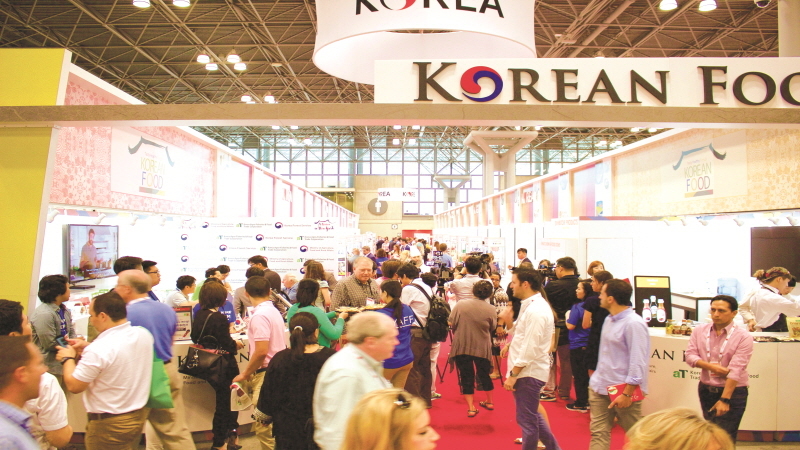 The fact that global consumers have encountered and loved Korean food that is healthy and tasty has been largely due to the efforts of Korea Agro-Fisheries & Food Trade Corporation (aT), which has produced high quality agricultural and marine food products and laid the basis for overseas expansion. I met with Bae Jin-suk, the export director, who is moving forward to achieve the company’s export goal of $ 10 billion, even though he recorded the highest export value ever. 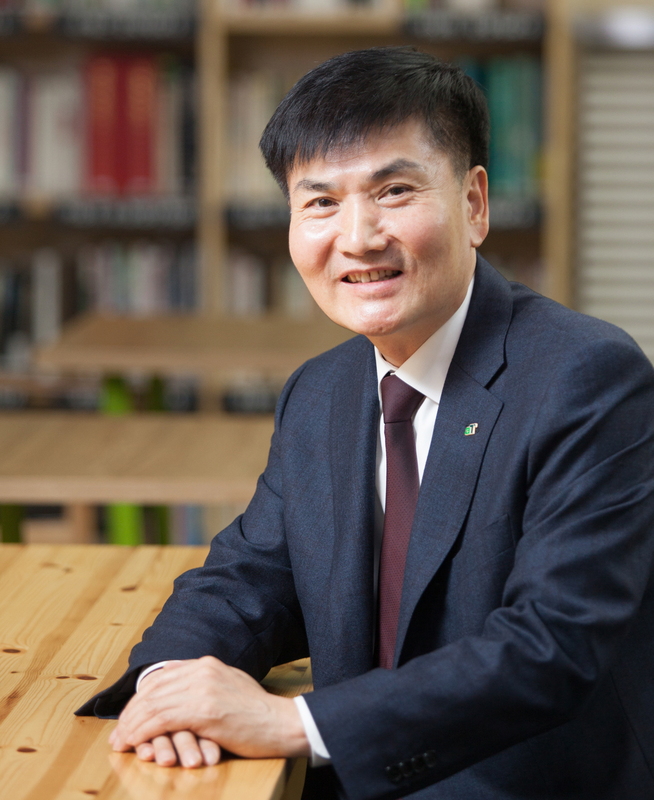 Baek Jin-suk Food Export Director, Korea Agro-Fisheries & Food Trade Corporation. What is Korea Agro-Fisheries & Food Trade Corporation? aT was established in 1967 as “Rural Development Corporation” to contribute to the income growth of farmers and fishermen and the balanced development of the national economy. It is a public institution with the mission of securing stable food supply and improving the quality of life through the promotion of the agro-fishery food industry. In 2012, it also took on the responsibility of cultivating the food industry, and the institution changed its name to “Agro-Fisheries & Food Trade Corporation(aT).” In Korea, we have 11 regional headquarters. Overseas, 12 branches are active in Asia, Europe, and the Middle East. aT is carrying out projects in various fields such as price stabilization, distribution improvement, export promotion, industry upbringing, as well as supply and demand for the profit of farmers, fish producers, and consumers. First, we buy stocks of agricultural products designated by the government and manage them for sale and export. In addition, we foster and support production sites and wholesale markets, so that direct transactions of agricultural and marine products can be activated, and we share distribution information. Exports are important, but we also commit our efforts in diverse areas. We build and provide information that is the basis for overseas market development, support funds to create an export base, and open markets. In order to cultivate the agricultural and fishery food industry itself, we are building infrastructure, cultivating traditional foods, and supporting related companies. 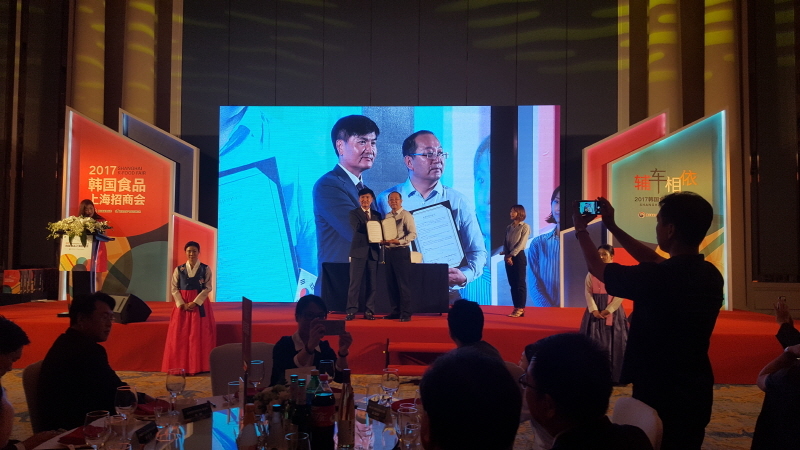 In Shanghai , we signed an MOU with Chinese food specialty media to expand Korean agricultural exports. What kind of activities does aT carry out to expand the export of agricultural and fishery products? aT is the only specialized agricultural export agency in Korea. We provide services to farmers and companies, which have already exported or are interested in exporting, so that our agricultural and marine products can be recognized not only in Korea but also in the world stage. We are striving to cultivate Korean-style “Zespri” and “Sunkist,” which are leading from production to exportation. We are accomplishing this through the construction of infrastructure for the stable production of agricultural products and stable transportation of logistics channels, which are the most important factor. We also operate a joint logistics center, and entered into a business agreement with large foreign retailers to establish a global open network to promote exports and promotion. Even if the infrastructure is firmly established, it will be difficult to attract overseas consumers unless product competitiveness is guaranteed. We train specialists for individual farmers and related companies, providing overseas market information to develop safe and high-quality products. In order to ensure that excellent products are introduced to overseas consumers, we support customized marketing in local markets, such as participating in international fairs in various countries and operating promotional pavilions. Through these efforts, our agricultural and food exports have more than doubled over the past 10 years from US $ 3.4 billion in 2006 to US $ 8.6 billion in 2016. Exports of agri-food products grew 7% year-on-year to US $ 8.6 billion in 2016, marking a record high. I think this was particularly significant because we achieved this despite the bad circumstances?the global economy was depressed and Korea's total exports also decreased by 5.9%. This year, too, we are expecting a record high of $ 5.9 billion, up 7.1% from the same period last year. Exports of agri-food products have a positive effect on enhancing the competitiveness of our national farms by producing higher-quality products and maintaining appropriate prices. In the agricultural products export sector, which has a significant effect on the overall economy compared to other industries, the value added is 1.5 times higher than the export of electronic products. In terms of inducing employment, the effect is said to be 5.9 times higher. It is also effective in spreading Korean food culture overseas, which is an important part of the spread of Hallyu. What are some differences in preferred Korean product lines according to the target consumer? Of course, because the characteristics of the market vary by country and region, we are selecting promising items and marketing differentiated products accordingly. 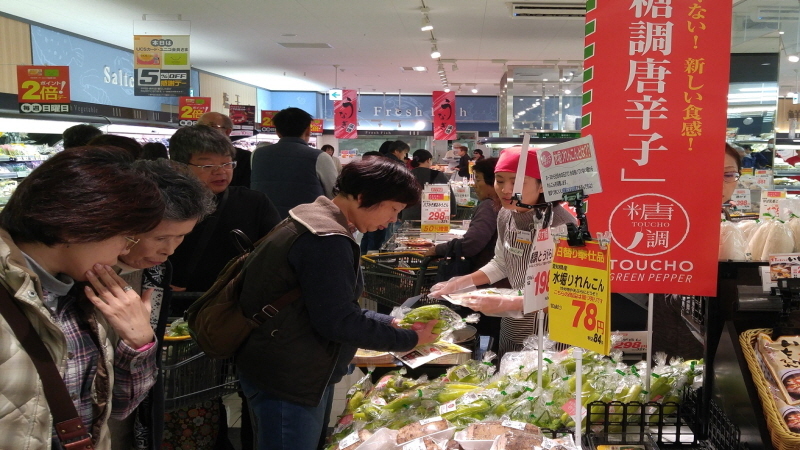 First, we introduce healthy functional foods in Japan. We discover and promote new products, like sugar-bell peppers with that can suppress blood sugar levels. For Chinese consumers, we use SNS to focus on online marketing and recommend products tailored to the consumer segment, such as infant and toddler food. In ASEAN countries in Southeast Asia, we are focusing on products preferred by consumers such as strawberries and pears. For example, we are making a menu of strawberry ade made from Korean strawberries and making efforts to secure more diverse consumers. The main products in the U.S. market are fruits, beverages, and sauces. In addition, we are actively participating in vendor fairs to meet ethnic markets and connecting with more local people by linking them to school or company meals. For European consumers who prefer mushrooms, noodles, and frozen foods, we use fairs and antenna shops (retail stores directly run to identify trends). Finally, we are introducing ginseng, fruits, and noodles for premium consumers in the Middle East. As a food export director, I was told that you were at an overseas branch before taking charge of aT's export department. Apparently, you faced struggles in advertising Korea's agricultural products. What was the most memorable thing for you when working overseas? I still vividly remember when I was named head of the Singapore branch in 1999. It was very different from now, when not only the general menu but also the desserts such as bingsu were popular. At that time, the market of Southeast Asia was completely undeveloped for Korean food, so I had a huge responsibility. In order for Korean food to enter Singapore, we first contacted merchandise planners from local large retailers. We were patient and finally persuaded a retailer to give us a chance to do a special sales event in front of a store. Singaporeans' awareness of Korean foods was so low, and so we prepared for the event with both anticipation and concern. As it turns out, I saw that the main products such as pear, apple, tangerine, and ramen sold very well. 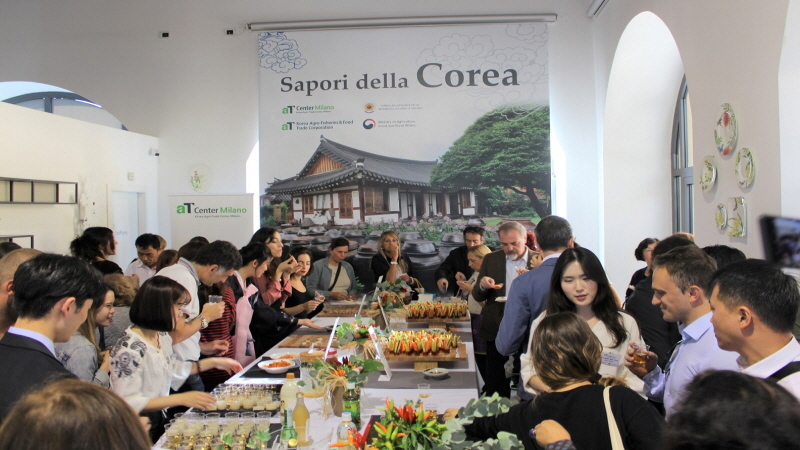 We not only held the event, but also actively promoted Korean food. We did things like send mail to Japanese societies, who share a similar food culture as Koreans, as well as Korean Associations. This led to a great reaction. The local distributor who saw the success of the first special sales event immediately accepted our entry as a Korean food company. I was not satisfied with it and met Singapore food planners from time to time and meticulously took follow-up measures such as proposing a store location where our food could be sold well. I gained the trust of other stakeholders and successfully made the entry into the Southeast Asian market for Korean food, which was my best overseas memory. What kind of effort do you think is needed to expand the scope of Korean agri-food products in the world market in the future? The export volume of agri-food products has been steadily growing to the highest level ever. aT has set up various strategies to maintain solid growth in the future. Currently, 50% of all exports go to Japan (22%), China (17%), and the U.S. (11%). Last year, the Task Force (TF) team was formed to diversify export markets and to carve out promising, new markets. Starting this year, we are helping companies that are already in the market and conducting market research activities through market pioneers dispatched to five countries including India, Brazil, Kazakhstan, South Africa, and Italy. Recently, there have been many changes in the trade environment, such as the protection trade of the U.S. Trump regime and the Han Chinese government, and it is expected to be difficult in the future. 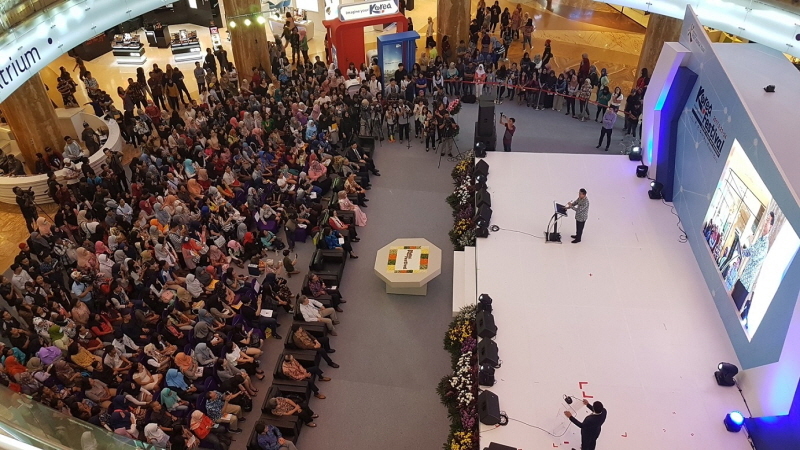 However, attention is focused on the economic growth of emerging economies in Southeast Asia and the market for new products such as infant foods and functional foods. Meanwhile, we will lead the opening of new markets such as South America and the Middle East (Halal). Since exports to China are sharply decreasing, we would like to pursue a new “Southern Expansion Strategy” by tapping into the Southeast Asian market, which has high potential. We are developing strategic products such as strawberries and grapes for Thailand and Vietnam. We will not only promote through internet influencers and entertainers, but also target consumers with high purchasing power. We will also promote our sales through various platforms such as online shopping malls, TV home shopping, as well as offline stores. In order to continuously expand exports, it’s more important to enhance our competitiveness in terms of price and quality. First of all, the foundation for mass production of high quality and safe products should be established. We will strive to reduce production costs, by organizing export-oriented organizations rather than individual farmers, and secure bargaining power in negotiations with overseas buyers. ▼ NextLocation Manager, a job that roams the country to find locations.